The post title is an idiom, or figure of speech, meaning one must deal with a sensitive or delicate situation or that one must tread carefully. I had the misfortune of a literal case of walking on eggshells earlier this week. I mentioned that a mallard hen had nested behind the clematis trellis. Yesterday I was cleaning up the storm mess of leaf clumps and twigs and noticed nine broken eggs. The duck was not on her nest. Raccoons are known to raid duck nests and there were a couple of “calling cards” left in the yard suggesting one or two may have been responsible. The hen was on the roof of the house looking down at the nest. She was favoring her left leg. When I checked on her an hour later, she was gone. It has been quite stormy since Thursday and we may not see a turn for the better until Monday. Monday is the only day without a rain chance all next week. A church has a sign up front reading “Thank you, God, for the rain. We’re good now!” Sometimes you get what you pray for. It is not a secret that I am clumsy, and I have the scars to prove it. I have had to tread gingerly, to “walk on eggshells”, because of possibly exacerbating an injury or repeating an embarrassing stumble. Thankfully, the platform shoe era of the late 1970s and early 1980s is no longer with us. I had a couple memorable face plants courtesy of those evil contraptions. The only thing more dangerous was dressing in combustible polyester clothing and dancing in a crowded disco where everyone had lit cigarettes. Darwinism must have taken a break during the disco years. We have all had to “walk on eggshells” at some point for differing reasons: fear of hurting someone’s feelings, fear of reprisal, handling a volatile situation, gently encouraging or supporting someone. As a manager, I would deal with occasional volatile situations, especially dealing with clients. I gave performance improvement plan recommendations that could result in job termination if not completed. I recently was on the receiving end of some news delivered very gently because the other person was concerned about my feelings and reaction. It was very touching, and it turned out the walking on eggshells was unwarranted. Being concerned about someone’s feelings while having the courage to deliver the news showed a lot of compassion and class. Expressing feelings to another person is another common reason for walking on eggshells. I still find it hard properly expressing feelings, though I think I have gotten better at it through the years. Perhaps we should be more open with our feelings towards those closest to us. It would greatly reduce misunderstandings, although it would completely eviscerate the romantic comedy and romance novel industries. You may notice many of my posts end with the hope that you give a meaningful hug to your loved ones. Lucy would give me at least a dozen hugs a day; now I go weeks without receiving a hug. Do not take a hug from a loved one for granted, and do not waste the opportunity to give one. I know how hard it is to tell someone how much you care about him or her, but you should do so occasionally. Actions speak louder than words, but actions in addition to works are louder still. It is a wonderful form of positive reinforcement. Whether you have recently started dating, or you and your spouse are married long enough to reach the precious gemstone anniversaries, take a moment and consider how lucky you are to have someone who wants to spend time with you, and how that brings joy to you. Joy is contagious but not harmful, so infect the world around you. Dad could not take part in the deck rebuild project, but Mom, John, and I (OK, mostly John) got it done. Dad is having an easier time reading now, so he enjoyed a book I recently finished. He also got a change to kick back and enjoy the day. I inherited my love for reading and my boundless curiosity from my dad. I also tried being as outstanding a husband to Lucy as he is for my mother. I did not inherit his mechanical talent and have the blisters to prove it today. 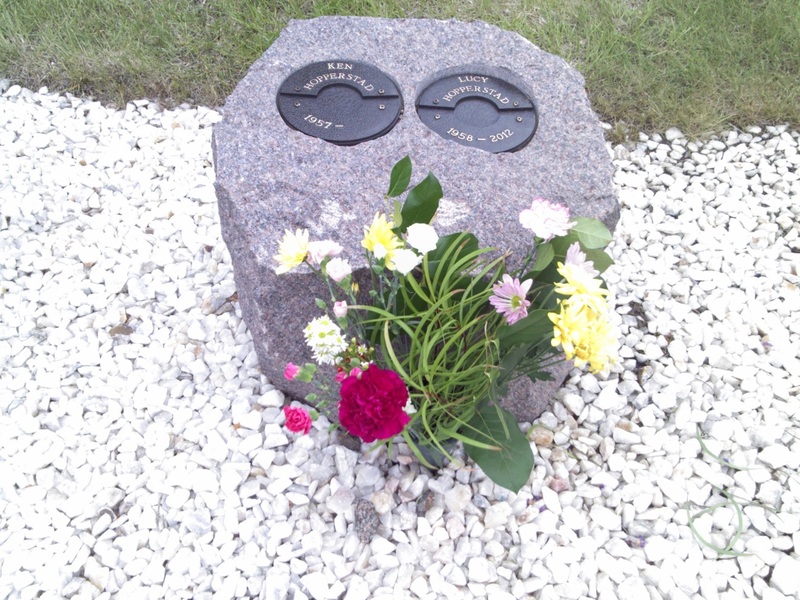 This is my first Father’s Day without my father-in-law, and I miss him very much. He was a second father to me. Bob was gentle and kind, and he accepted me into the family without hesitation. Lucy inherited his quiet strength, his love for family, and quite a bit of his mechanical ability. When we would get ready-to-assemble furniture, Lucy needed to help me with figuring out the diagrams. I have some spatial orientation issues and Lucy could easily see what I could not. Bob also inspired me being the best possible husband to Lucy I could. My father and father-in-law are still blessings in my life. I learned so much from them both and I am grateful to them. Steve, Suzy, and Julie, you are in my thoughts and prayers today. I hope you find solace in the love your father gave you and the love you gave him in return. Stay strong, remember your father’s goodness, and give your children a hug from me. If you are lucky enough to spend time with your father or father-in-law today, give him a meaningful hug and tell him how much you love him. If you are separated from your father or father-in-law either by distance or by his passing, take a few moments to remember him. Happy Father’s Day to all of you men blessed with children! As of late, we have plenty of rain to blame. Our summer seems fake, with spring doing the real moving and shaking while summer provides a front. The Milli Vanilli song referenced in the title is similar to our summer; an uncredited singer laid down the vocal tracks while the two credited members lip-synched on video and during performances. I could not escape the rain when I visited my parents this weekend. It rained hard enough Saturday night and Sunday morning I had to move my car because of street flooding. Monday started cool and gray but ended sunny and warm. Light jackets and long pants gave way to short sleeves and short pants. On Tuesday, I attended a Twins game at Target Field. Lucy had wanted to go see a game there, but cancer stole that opportunity. We averaged about three Twins games per year, but our last game was August 2010. Target Field is beautiful, the weather was perfect, and the Twins picked up a badly needed win. Lucy would have enjoyed the evening. Our “too much of a good thing” rain is causing problems. Southern Minnesota has large plots of farmland that is unplowed. The crops, if they could be planted today, would be almost two months behind. Resorts are experiencing cancellations. Mosquito, fly, and tick populations are booming, and the silver maple trees have a bountiful crop of “helicopters” dropping on driveways and gutters. Cottonwood seed cotton is thick enough to look like snow. My lovely sinus problem is high gear and people I know with allergies are in a heightened state of misery. People generally like sunny weather. Constant dreary weather and unseasonable coolness cause crankiness, sluggishness, and a marked decrease in intelligence and patience (at least from what I can tell on the highways). When the sun makes a cameo appearance and the temperature becomes more summer-like, it is like a rebirth: colors are brighter, sounds are cheerful, and all seems right with the world. Then the weather changes and we are jarred back to a dreary reality with only hope for a better day keeping us going. There are some advantages to the rain. The cloud cover and gentle pattering of the rain is soothing. Sleeping late is easy, especially if one is on vacation and has earned a break from job stress, and that can lead to inspiration to a blog post, courtesy of a Facebook status update I saw. I would have indulged, were it not for several close lightning strikes at 6:30 am. That was another disadvantage of the unsettled weather. Lucy and I experienced an unexpected rain shower on the Gateway Trail north of Oakdale, MN almost ten years ago. It remains one of my fondest memories. We were nearing the end of a twenty mile bicycle ride on a slightly humid August day. Lucy noticed some clouds forming and asked me if we would make it back to the car before it would rain. I did not think the clouds were of any consequence, and assured her it would not even rain. About fifteen minutes later, we were riding in a gentle warm rain shower. We were sweaty and a bit tired, but the rain helped cool and refresh us. Lucy had a huge smile on her face after the rain quit after ten minutes, and she smiled all the way back to the car. It would have been easy for Lucy and I to “blame it on the rain” when she received her cancer diagnosis. We chose to face forward no matter what the cancer battle threw at us. Like the unexpected rain shower years ago, we tried to make the best of it and it helped us cope. It is admittedly much harder to do so without her supporting me, but I do my best. The sun will shine once again. Give your loved ones a meaningful hug and feel the joy they add to your life. For those of you who are starting a new chapter in your life, remember a journey of ten thousand miles begins with single step and I wish you good luck and Godspeed. Thank you for your support. 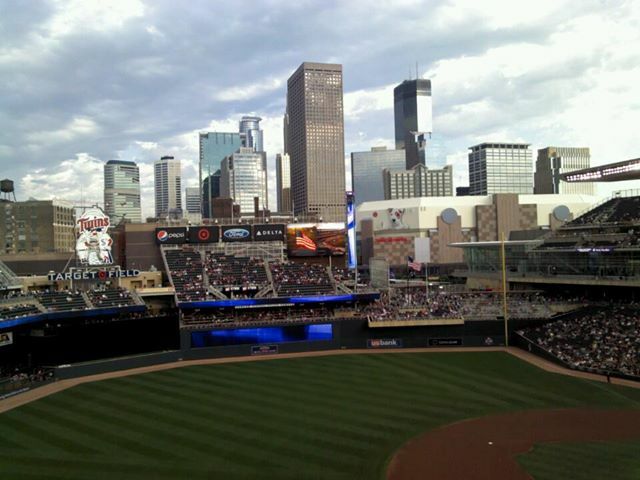 The view from my seat at Target Field, June 11, 2013.